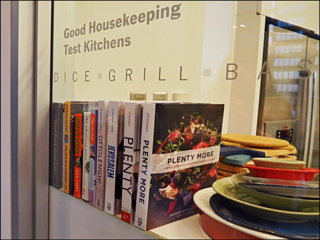 After finishing up at the recent James Beard Foundation Conference (this year’s theme was “Rethinking the Future of Food”), attendees were invited to tour the Good Housekeeping Institute in New York City. 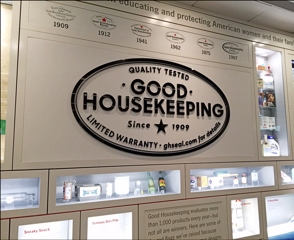 Located inside the Hearst Tower in midtown Manhattan (near Columbus circle and just south of Central Park), the Good Housekeeping Institute is responsible for testing thousands of consumer products for safety, durability, quality, and value. Their goal is to educate, protect, and empower consumers when they purchase. Only the products that pass get the honor of wearing the Good Housekeeping Seal – a symbol of quality and safety that has been trusted by consumers for over a century. Looking up at the magnificent glass structure that is the Hearst Tower, I had no idea of what awaited me inside. After being whisked inside the building’s beautiful, highly stylized, modern atrium, the elevator took us to the 29th floor. It is here, in this modern skyscraper, with its offices full of advertising executives, stockbrokers, and financial institutions, and high above bustling Manhattan, that the gritty and unending work of testing products to help ensure your safety and satisfaction is done. When you exit the elevator, and proceed through the double doors, the first thing you see is a display of products that didn’t pass the tests and get the Good Housekeeping Seal – a sort of “Hall of Shame” or products that got the “not-so-good housekeeping” seal. Located here were items such as the “dubious diet pills,” “fake fitness belt,” “sneaky snacks” and banned cigarettes. To balance the negative feelings that arise from this display, they juxtapose those items with a display of products that got the Green Good Housekeeping Seal. As you walk down the hallway, you start to see what is at the heart of this place. The first room you pass is a sterile and clinical laboratory. The technicians are clothed in lab coats, testing hair conditioners and other skin care products. As the hall continues, you pass a temperature controlled room where they stretch and manipulate fabric in controlled conditions to truly test their durability and wearability of an item. They even test the shrinkage! Did the color fade or stay vibrant? Did the towel keep its “feel” or did it become tattered and frayed? These questions, and others like them, are what researchers are trying to answer. In one room we passed, a new model of vacuum cleaner was being tested as it was hooked up to a mechanical contraption that automatically moves the vacuum back in forth across a dirt laden carpet sample. Passing by a room with piles upon piles of cookware, we had obviously landed in the middle of the kitchen appliances department. Mixers, ranges, and refrigerators of all types lined and filled the entire space. 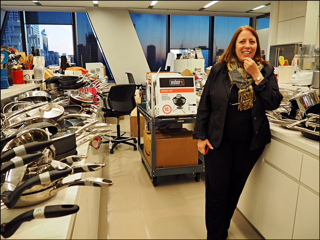 Sharon Franke, Director of Kitchen Appliances and Technology, tests everything from pots and pans to ovens and refrigerators. 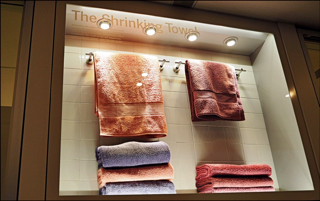 In this department, they put safety, performance, ease of use, durability, and design to the test. Sharon explained how they test the rivets of each pot to ensure that each handle is sturdy and secure. She also confirmed that the Kitchen Aid stand mixers still reign as the king of all consumer electric mixers. When asked whether size matters, Sharon stated that, while the smaller ones are good for everyday use, you should use the large ones for breadmaking. 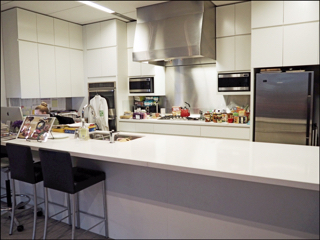 Of course, one of my favorite rooms was the Good Housekeeping Test Kitchen. Here they create, taste, and triple test recipes for their magazines and cookbooks. They even invite in taste testers to sit at the counter and sample snacks to ensure that these items deliver on the taste. One of the things I appreciated is they address the needs of the masses by using the brands and models of refrigerators and ranges that are most commonly used. Here you will find no Wolf ranges or Sub-Zero refrigerators. Although you are in a luxury high rise you can tell that their business model is all about making you feel right at home. 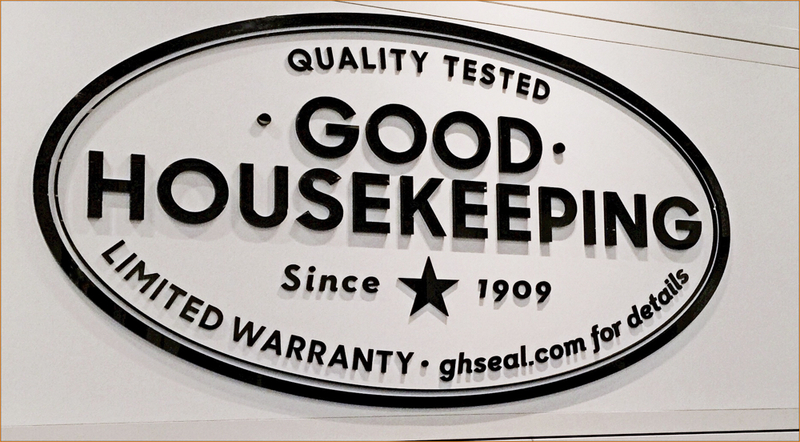 The Good Housekeeping Seal is what all manufactures aspire to receive. We should be grateful that, perched a top the Hearst Tower, this Good Housekeeping facility is one “ivory tower” that just doesn’t have ideas, but puts them to the test.